In many blogs and articles will refer to regular giving. What do I mean? Regular giving is, to me and all those in Pareto Fundraising and Pareto Phone, the act of giving an automated gift to a charity, usually by credit card or straight from bank account. It is usually monthly. It is also the biggest revolution in non-governmental fundraising history, producing more growth for more charities than anything else, ever. Large and small charities have had their ability to provide services revolutionised by regular giving. For a great example, check out this article by Kate Hoelter, Fundraising Manager at The Lost Dogs' Home. Last year we gathered together a group of charities in Australia, and analysed their income by source, excluding legacies and government. As you can see in the chart below, HALF of their fundraising revenue of $160m p.a. now comes from regular giving. 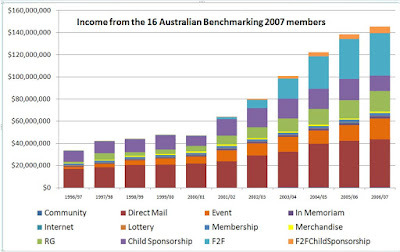 (F2F, RG, Child Sponsorship and F2F Child Sponsorship make up the four top segments, orange, blue, purple and green - and all are types of regular giving). If you work in charities, and raise money from individuals it is essential that you investigate it further if you haven't already. If you don't, you are negligent and should fire yourself! I just woke up and realised I was getting old.